Hardware modulator and demodulator support EN 300-744 DVB-T /ARIB STD-B31 ISDB-T/ABNT NBR 15601 ISDB-Tb reception and retransmission. 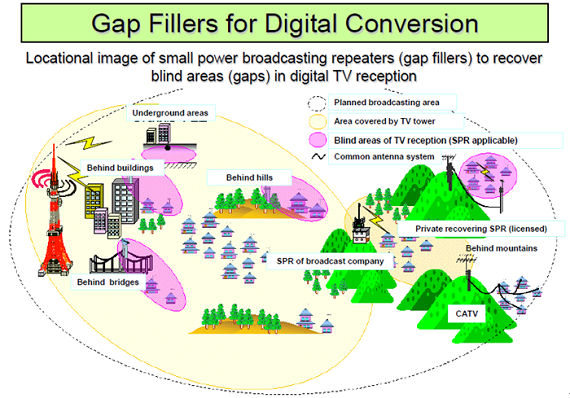 TV RF signal is demodulated to a transport stream (TS), and then modulated to a new TV RF signal with fully hardware digital processing without any MER loss or any noise addition. Built-in 31-way PID filters and PCR re-stamp. 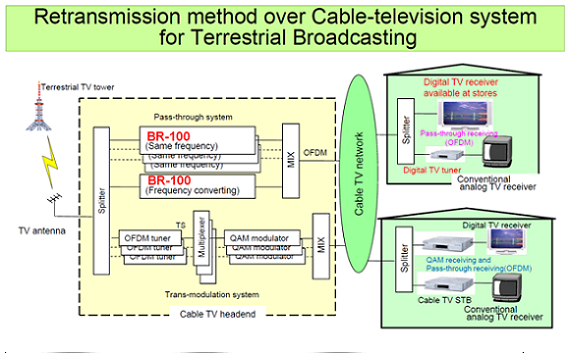 Infinite digital TV signal extension can be achieved with BR-10. BR-101E supports EN 300-744 DVB-T while BR-101J supports ARIB STD-B31 ISDB-T/ABNT NBR 15601 ISDB-Tb. BR-101EH is a special edition of BR-101E for HAM TV application; BR-101EH can support up to 1.2G band with high RF power (-18dBm), but 2’nd and 3’rd harmonic in 950MH~1350MHz band is not well filtered. BR-101E supports configurable bandwidth from 2MHz to 8 MHz. BR-101J supports configurable bandwidth 6/7/8 MHz. The input and out channels are totally independent. The new (Tx) channel’s frequency, bandwidth, code rate, guard interval, FFT, constellation can be totally different from the original (Rx) one’s. If the input channel data rate is less than the output, auto null-packet insertion will be done in the modulator. If the input channel data rate is larger, setting PID filter properly to filter out unwanted packets may avoid data overflow. PCR re-stamp mechanism is supported to keep the correctness of PCR when PID’s filtered or null packets inserted. *1 : Bandwidth 2/3/4 MHz or 5/6/7/8 MHz are selected by a jumper. *2 :BR-101E/J U-band low pass filter is designed @950MHz, so 1.2G band power is filtered to such a low level. *3:There could be MER loss in high gain/attenuation level.